With a flaky all-butter crust that's studded with crisp crystalized sugar holding a mountain of sweet autumn apples, this is the last apple pie recipe you'll ever need. What Makes this the Best Apple Pie? On the outside, this pie has a flaky crust with a crisp texture that explodes with crunchy bits of sugar and rich buttery flavor with every bite. The inside is overstuffed with sweet, tangy apples coated in a thick glaze, accented with just enough warm spices without overpowering the fruit. Sound good? Here’s how it all started. As a kid, the holidays were one of my favorite times of the year because this meant my step-dad would be baking apple pies and currant slab. A man of few words, he doesn’t cook often, but I loved watching as he pulled out a yellowed and stained 3×5 handwritten recipe card from a rusty mint green recipe box and turned a few ordinary ingredients into something truly extraordinary. As an adult, I’m not much of a baker, but I’ve spent the last 20 years refining the skills I learned as a kid, and I’m finally ready to share everything I’ve learned along the way with you guys. 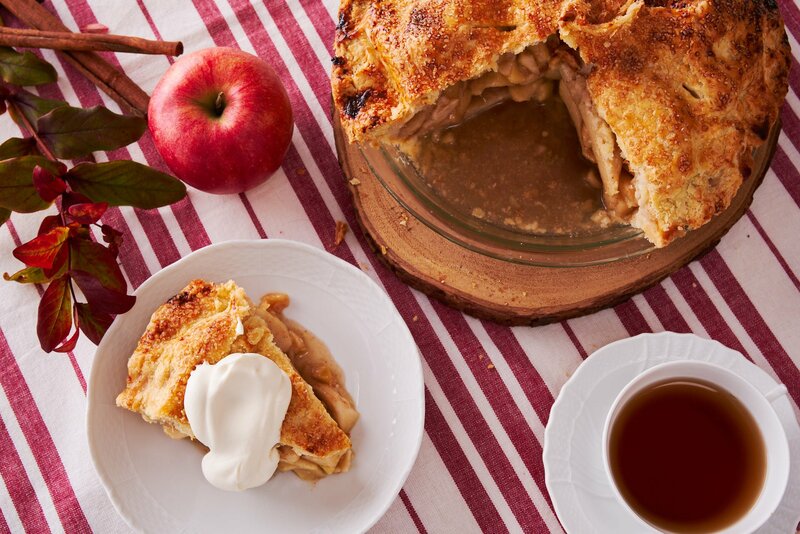 So without further ado, here’s everything you need to know to make the perfect apple pie. To understand the role of flour, you first have to understand the role of gluten in baking. Despite what scaremongers who want to sell you things will have you believe, if you don’t have Celiac Disease or a specific allergy, gluten is not evil. It’s a naturally occurring protein that forms when water is added to wheat flour, and the mixture is agitated. Gluten literally provides the building blocks that make some of the tastiest foods, like bread and noodles possible. As gluten chains form, it creates an elastic network that traps air and helps breads rise and makes noodles chewy. Since “chewy” isn’t an adjective you want to associate with pie dough, most recipes are written to minimize the creation of gluten in your crust. With this in mind, I once tried using a low-gluten flour to make a pie. The result was a crust that was crumbly and extremely hard to handle with a weird tenderness that was almost cake-like. As it turns out, a little gluten is actually a good thing and helps make the crust flaky. Curious, I also tried making a crust from high-gluten bread flour, and while it wasn’t horrible, it was was a little tougher than I’d like. After all this experimentation, I can safely say that unbleached all-purpose flour works best. I’m using one with a gluten content of about 10.7%. The real key here though is to freeze the flour. There are two reasons for keeping your ingredients as cold as possible. The first is that colder temperatures slow the development of gluten in the flour, which gives you a bit more headroom to work the dough without making it tough. The second reason is that cold temperatures prevent the butter from melting and mixing with the flour. I’ll explain more about this later, but for right now, all you need to know is that cold is good. To avoid having to plan ahead for recipes like this (and to preserve the freshness of flour,) I always store my flour in the freezer. There’s some debate over the best source of fat to use for pie crusts and to pick the best one, we should first understand why fat is added to pie crusts. The first reason is that having alternating layers of fat and dough creates little pockets in the crust, which makes the crust flaky. This is why you want the fat (as well as the flour) to be cold, as it allows you to form flakes of fat that won’t get fully incorporated into the dough. The second reason is that fat inhibits the development of gluten. Last but not least, the third reason for adding fat is that it can add flavor to the crust. Here are a few of the options for fat in order from my most preferred to least preferred. Butter – Butter has a melting point of about 95 degrees F and it also contains about 16-17% water. The lower melting temperature relative to other fats make it a little more challenging to work with because you have to be careful not to melt it as you work it into the flour (remember, we need flakes of butter to form layers in the dough). The upside is that the water content in the butter creates steam as it cooks, puffing up the pockets it resides in and forming a light and flaky crust. The other huge benefit of using butter is that its flavor is unbeatable. I like using cultured butter(a.k.a. European butter). This doesn’t mean the butter it sophisticated, but rather the method in which it’s made. Ordinary American butter is made by churning fresh cream. To make European butter, the cream is first cultured (i.e., fermented) with bacteria which intensifies the flavor of the butter (think movie theater popcorn). Lard – Lard has a higher melting point than butter, and it also contains 16-17% water. 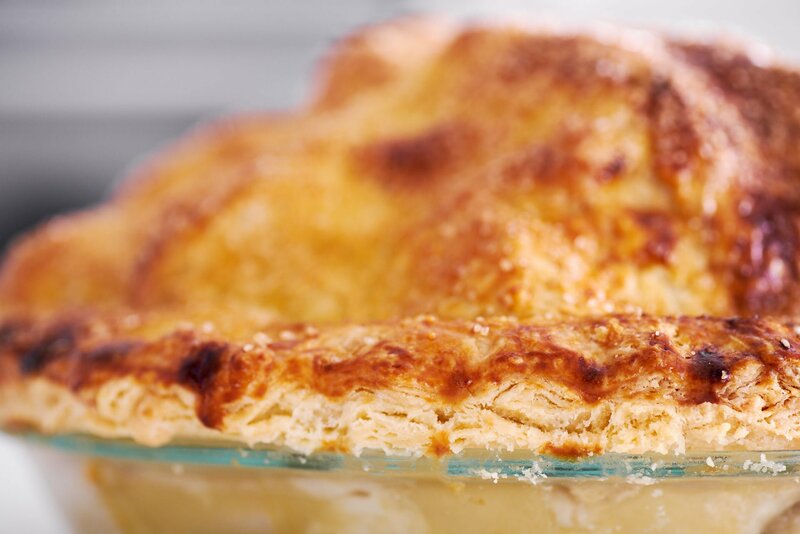 That’s why lard was historically the choice for making pie crust as it’s easier to work with yet it can puff your crust with steam in the same way that butter does. Finally, while lard has more flavor than shortening, it falls short of the flavor of butter, which is why lard ranks #2 for me when making pie dough. Shortening – Shortening is a solid fat with a relatively high melting point made by chemically altering vegetable oil so that it is a solid at room temperature. In the 20th century, shortening replaced lard as the goto fat for pie crusts because it was cheap and was considered healthier (less saturated fat and no cholesterol). Aside from the dubious nature of the processing it undergoes, I don’t like using shortening for pie crusts because it contains very little water and has no flavor. Oil – Oil is a liquid and is a poor choice for pie crusts because it will disperse evenly into the flour and will not give you layers in the dough. Most traditional recipes for apple pie calls for the use of Granny Smith Apples. These green apples are bracingly tart and are firm enough that they won’t go mushy when you bake them in the pie. While their tartness is nice, they aren’t very sweet (which means you need to add a lot of sugar), and they don’t have that scratch-and-sniff sticker apple flavor I want in my apple pie. As a compromise I see many modern recipes using a blend of Granny Smiths with more fragrant varieties of apple such as McIntosh, Golden Delicious or Braeburns. But wouldn’t it be great if there were one apple that had a balance of sweetness, tartness, and flavor; could come out of the oven without disintegrating; AND was widely available? Although they were originally hybridized in Japan around 80 years ago, Fuji apples have recently caught on in the US. Crisp, juicy, sweet and tangy, these apples are also loaded with apple flavor, which makes them good for eating raw. But it’s these same traits that make for a good baking apple, which is why I’m kind of surprised they aren’t used more in desserts. If for some reason you can’t find good Fuji Apples near you a few runner-ups are Honeycrisps and Braeburns. Although they don’t have a ton of apple flavor, Granny Smith’s do win on acidity. Most apple pies include some lemon juice in the filling to keep the apples from oxidizing, but in my filling, I double the usual amount of lemon juice to give the pie a bracing tartness that’s the perfect counterpoint to the sweetness of the apples and richness of the crust. Because Fuji apples are quite sweet, you don’t need to add as much sugar to the filling. That being said, this is largely a matter of personal preference, and I like my apple pie on the tart side of the scale. 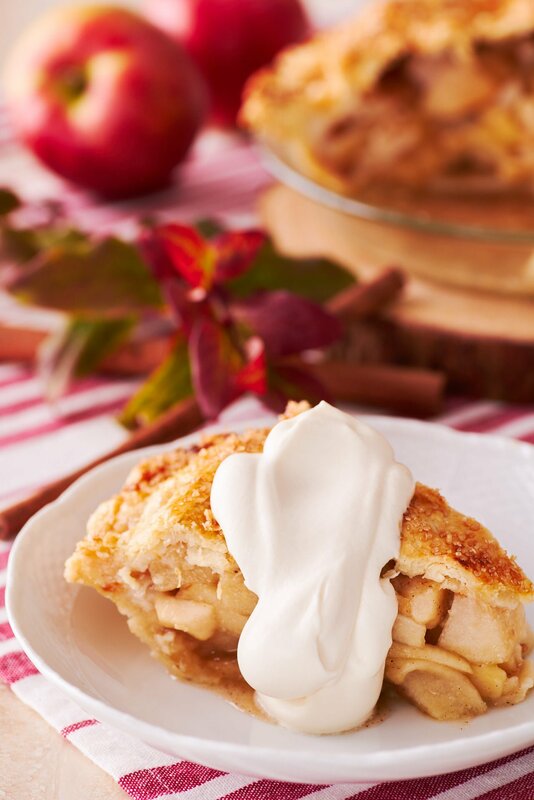 If you like a really sweet apple pie, you may want to add another 1/4 cup of extra sugar. As for the type of sugar, I like using unrefined sugar, such as evaporated cane juice. These “natural” sugars tend to have caramel notes, which go nicely with the apples, as well as with the crust. Over the years I’ve found that adding too much spice to my apple pies covers up the taste of the apples. This is fine if you’re using apples that don’t have much flavor, but Fuji apples have such a wonderful apple aroma it’s a shame to disguise it under too much cinnamon and allspice. Still, it wouldn’t be an apple pie without filling your home with the comforting aroma of sweet spices as it bakes, so I like to use a modest amount of cinnamon and just a bit of freshly ground nutmeg. Nutmeg is one of those spices that tends to lose its aroma quickly once ground, and unlike some other spices, it’s easy to grate on a Microplane, so I highly recommend buying your nutmeg whole. 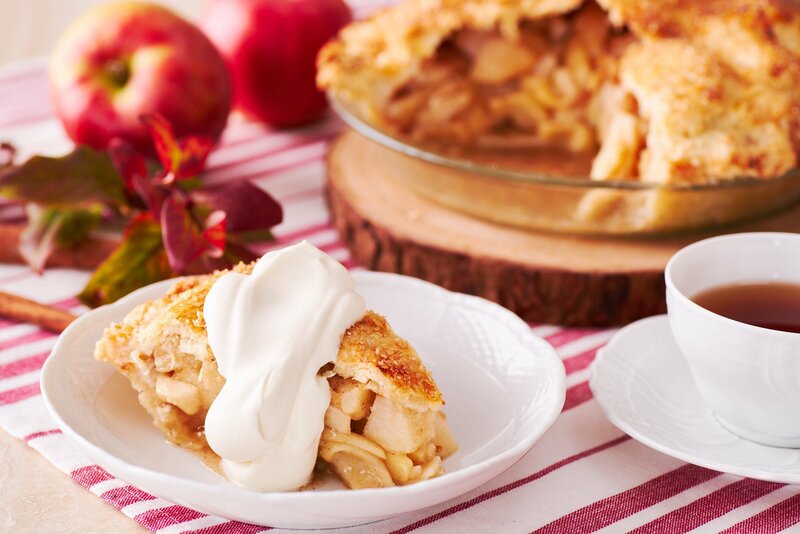 Together this duo gives the pie a warm accent to the sweet fragrance of the apples. As the apples cook, they will release a lot of juice, so it’s important to include some thickener in your pie, or else you’ll end up with a soupy mess. The most common thickener is a mixture of flour and melted butter. This is similar to how a gravy is thickened, but I’m not a fan of this method for pies. 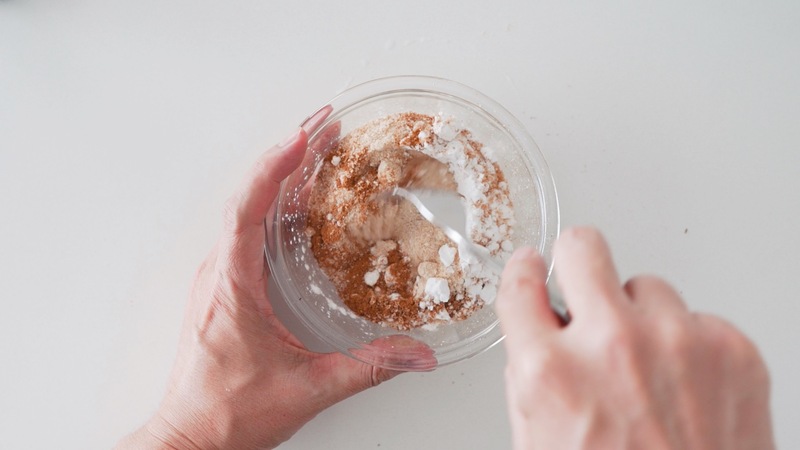 First and foremost, the juices that come out of the apple area clear, but flour does not gel clear, so the juices end up getting clouded by the flour. The second reason is that I want the flavor of the apples to come through front and center, and adding butter to them directly tends to mellow them out. For you butter lovers out there, don’t worry you get plenty of butter flavor in the crust and you can eat them together to get that creamy mellowness, but I also like having the option of going in for the filling alone, where the apple flavor comes through crystal clear and unmuddled. So what thickener do I recommend? I generally prefer using starches for my pies. My first choice is potato starch, but tapioca starch and arrowroot starch are both excellent alternatives. They all gel clear and have a nice gooey consistency that doesn’t get cloying. One starch I do try and avoid is cornstarch, which tends to get gummy as it cools. Now that you know everything you need to know about the ingredient that go into making the perfect pie, how do you bring it all together? As I mentioned in the sections above, it’s essential to work with cold ingredients to limit the development of gluten, and to ensure your butter doesn’t fully mix with the flour. Because butter has a lower melting point than other types of fat, this is particularly important for an all-butter crust. For the flour, I like to keep it in the freezer, for the butter I remove it from the fridge just before starting the dough, and for the water, I use ice water. It might be tempting to freeze your butter too, but it will be rock hard and next to impossible to flake by hand, which is why I recommend using it straight out of the fridge. The dough for the crust is mixed in two stages. In the first stage, you want to flake the butter into the flour without actually combining the two. 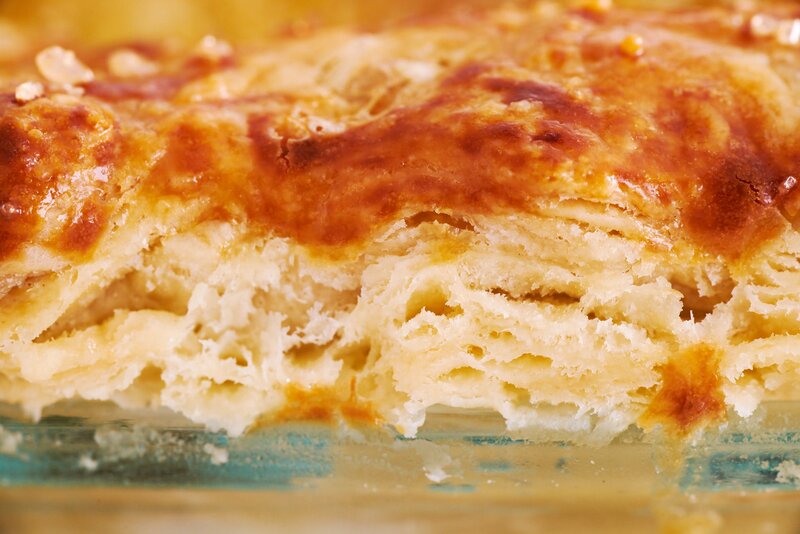 These thin layers of butter will remain in the dough until you put the pie in the oven, where the butter will melt and create pockets in the crust that give it it’s flaky texture. I do this by pressing the cubes of cold butter through the tines of a fork. This creates cornflake-sized pieces of fat that get coated by a layer of flour. It does take a bit of elbow grease, but it works better than any other technique I have tried. Pastry cutters will work okay, but they tend to chop the butter up rather than flaking it. My least favorite method is to use a food processor, which either leaves chunks of butter that are too large or over incorporates the butter and flour. Whatever way you chose, be sure the butter stays cold as you mix it. If you feel like the butter is heating up too much, pop the whole bowl in the freezer for a few minutes to cool things off. Remember, if you don’t have flakes of butter, you won’t have flakes of crust either. By now you should have a rough mixture of flaked butter and flour. This is where we move onto the second stage and add ice water to form the dough. The cold water prevents the butter from melting, but it also limits the formation of gluten in the flour as you mix it. You want to add the minimum amount of water possible while still having a dough that will stick together. The way I like to do this is to add two tablespoons of water to the flour and stir it in with the fork. Then I keep adding a bit of water at a time until I have a ragged dough that can be squeezed together in my hand. You shouldn’t have any loose flour left, but the dough shouldn’t be one big lump either. Now divide the dough in half onto two sheets of plastic wrap and use the plastic to form the dough into two disks. Wrap the dough and put it in the fridge. By chilling the dough, it will solidify the flakes of butter, preventing them from combining with the flour when you roll out the crust. This also allows any gluten that’s formed in the dough to relax, which makes it easier to work with. 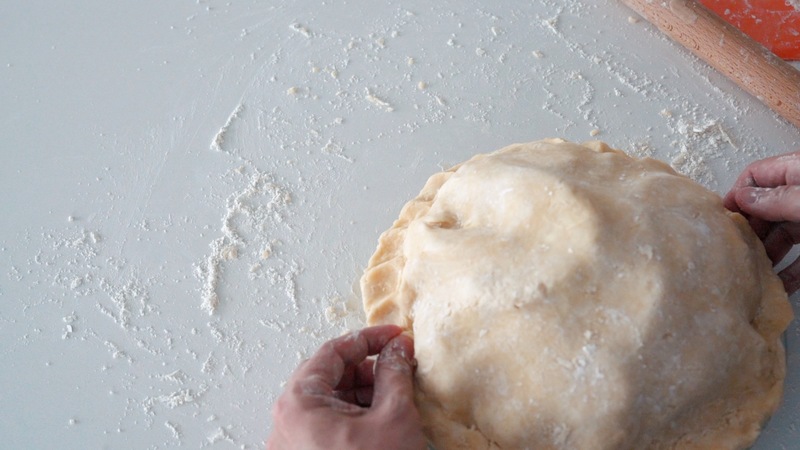 Once the dough has chilled, you can roll it out on a well-floured surface and assemble your apple pie. Check out the video below for a visual guide to the techniques above as well as my method of rolling out the dough. 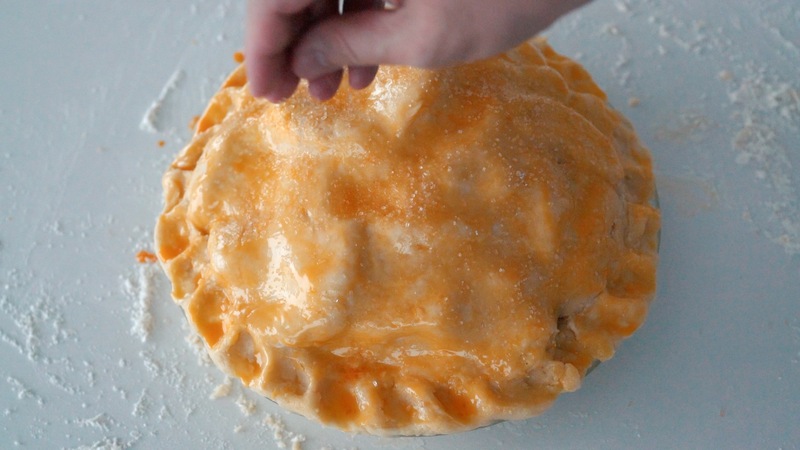 Aside from keeping the apples coated in lemon juice to keep them from oxidizing, there’s not much technique for making the filling. I like to mix the sugar, starch, and spices together first and then combine this mixture with the apples, as this ensures everything gets evenly distributed. One thing to note is that you may take one look at your pie plate, and one look at the huge bowl of apples and think “There’s no way all these apples are fitting in that,” but trust me, they’ll fit. You’ll need to stack them deliberately, and you’ll end up with a mountain of apples, but you’ll be glad you took the time to overstuff your apple pie. That’s because the apples will shrink considerably as they cook. Any less and you’ll end up with a sad sunken-in crust. Be sure to let the pie cool completely once before you try and slice it. This ensures the filling is gelled, so it doesn’t fall apart when you try and serve it. If you want your apple pie warm, I recommend reheating it after you’ve sliced and plated it. The pie is fantastic on its own, but if you want to take it to the next level, you can serve it with some vanilla ice cream, a dollop of creme fraiche, or a big fluffy cloud of whipped cream. 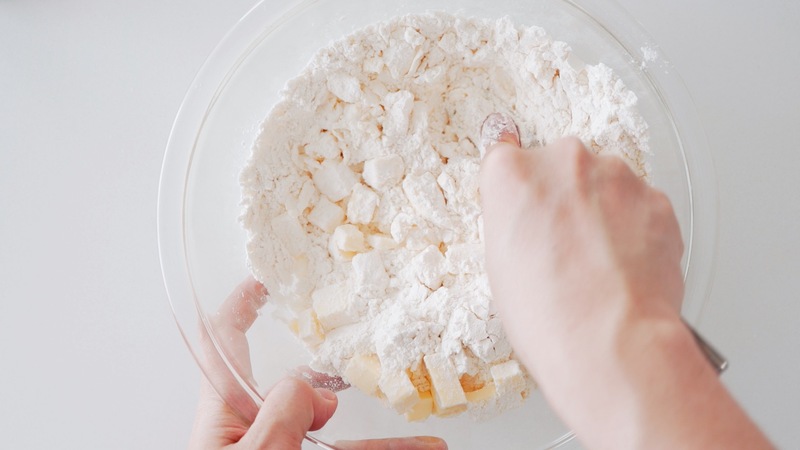 To make the dough, add the flour, butter, and salt to a bowl and use a fork to smash the butter. The goal is to force the butter through the tines of the fork to make small flakes of butter. Once you don't have any big clumps of butter left, move onto the next step. Now pour two tablespoons of the ice water into your flour and butter mixture and use the fork to integrate the water into the mixture. 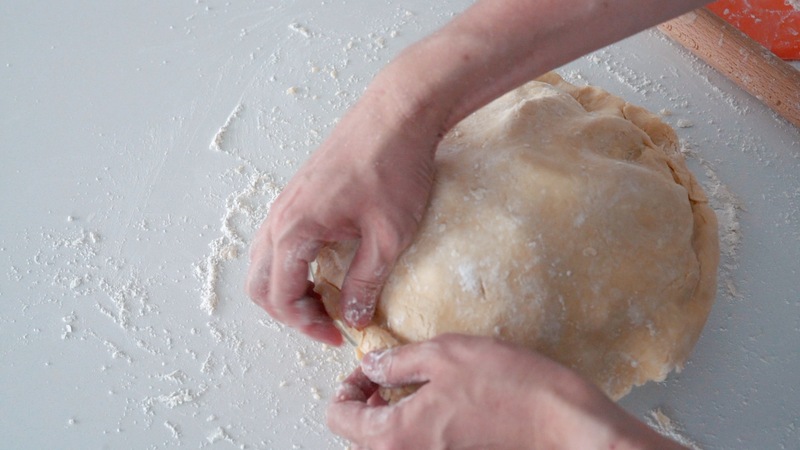 Continue adding the water a little at a time until the dough can be pressed together with your hand. Do not overwork the dough, or it will get tough. 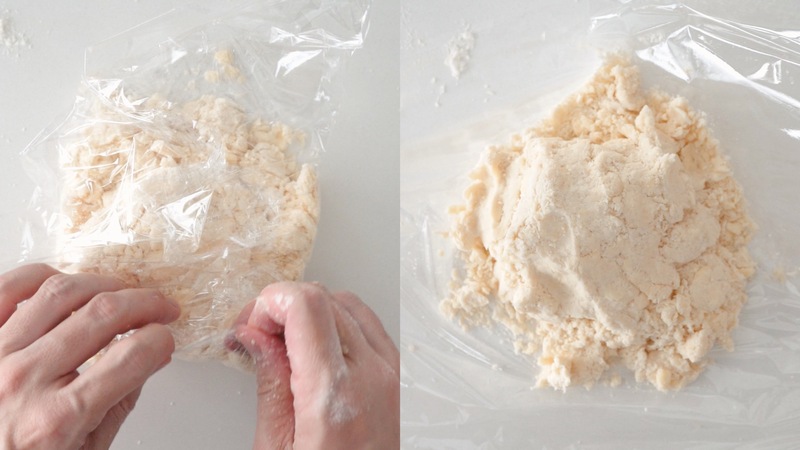 Divide the dough in half between two sheets of plastic wrap, and use the wrap to shape the dough into two discs. Refrigerate for at least one hour. 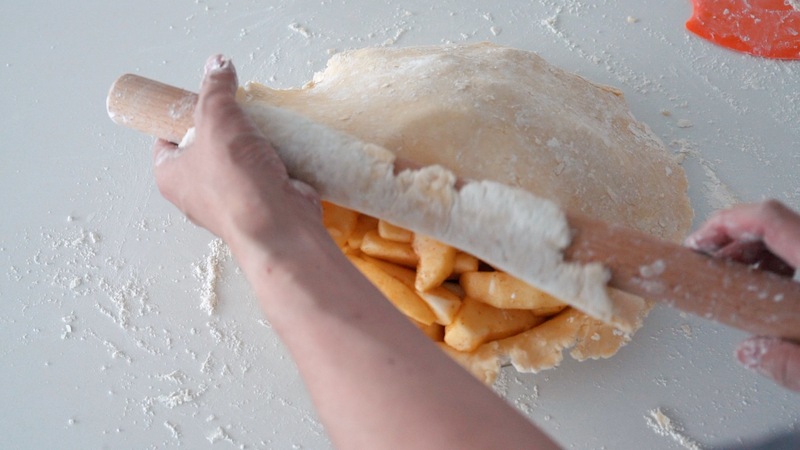 While you wait for your dough to chill, prepare the filling. Add the sugar, potato starch, cinnamon, and nutmeg to a bowl and stir to combine evenly. Peel the apples and then quarter them, removing the core. 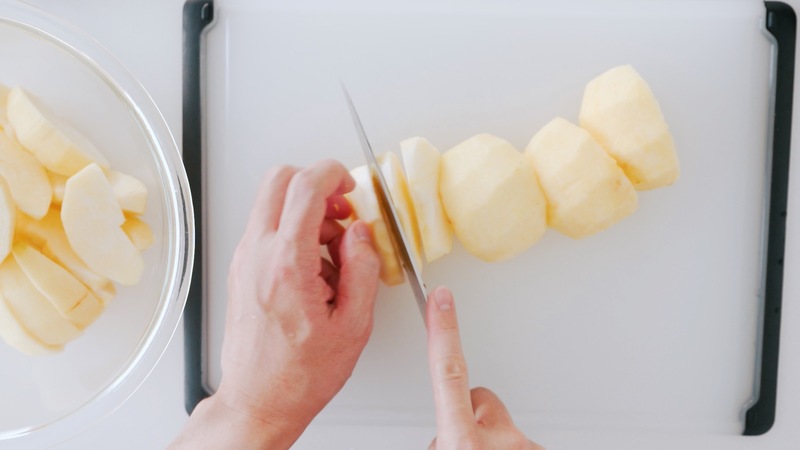 Slice each quarter into 3 wedges and add the apples to a large bowl. Sprinkle the apples with a bit of lemon juice to keep them from oxidizing. 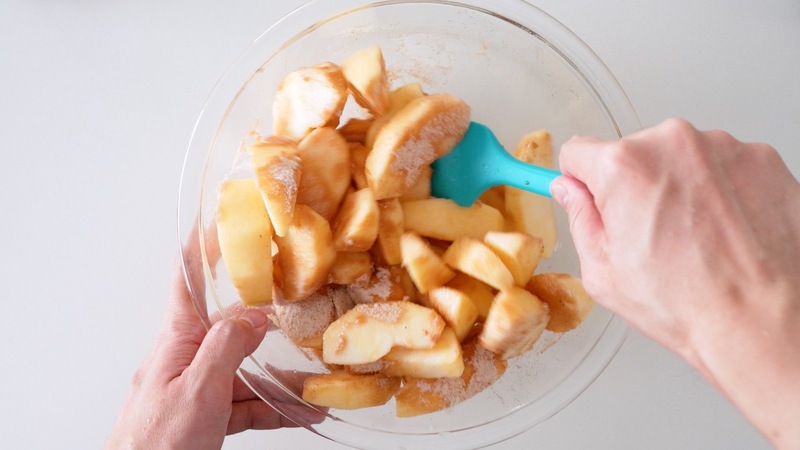 When you're done cutting the apples, pour any remaining lemon juice on top and add the sugar mixture. Stir to make sure the apples are evenly coated. 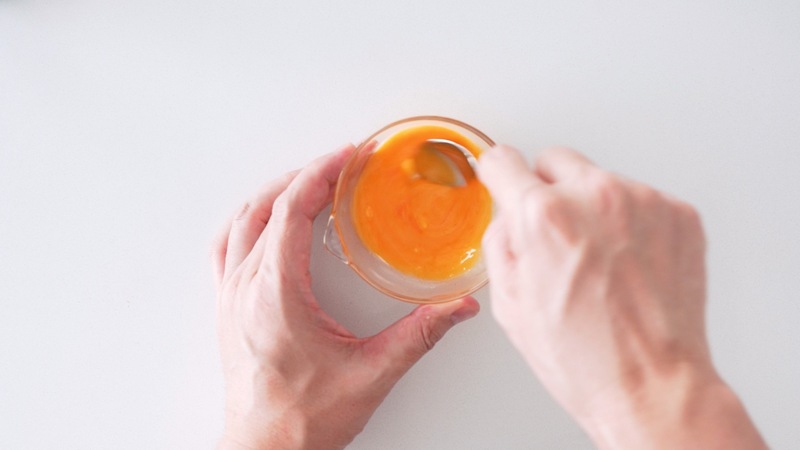 To prepare the egg wash, add the egg yolk, cream and a pinch of salt to a bowl and stir together. Put the oven rack in the middle position and preheat to 375 degrees F (190 C). 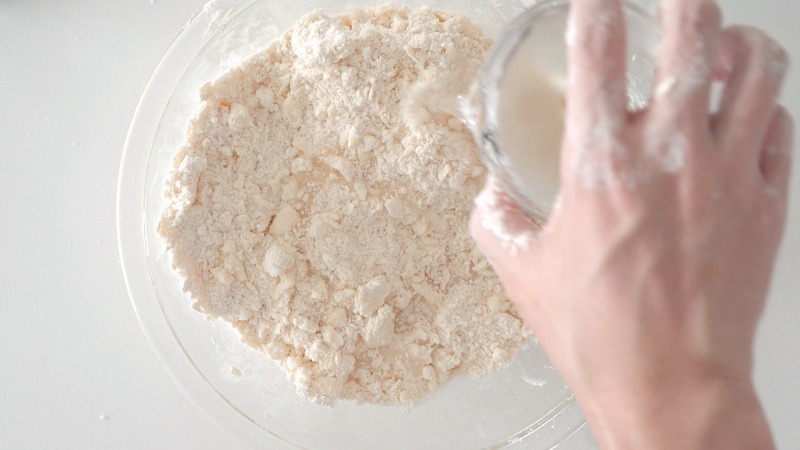 Take the dough out of the refrigerator, dust it with flour and place it on a well-floured surface. 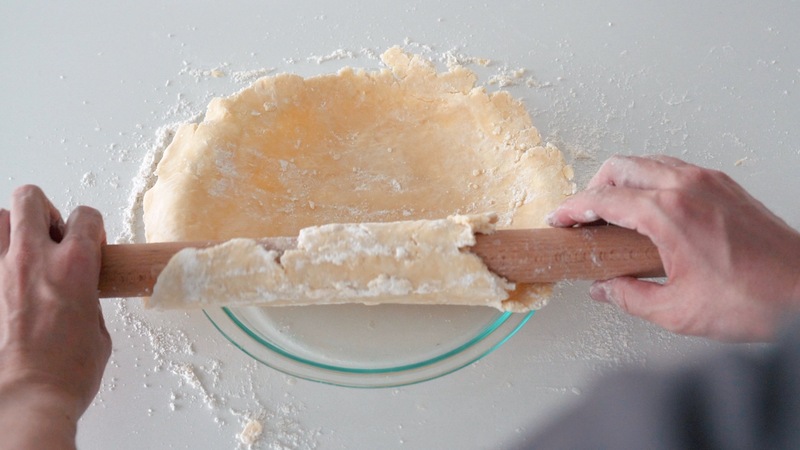 Use a rolling pin to slowly roll the dough out into a circle that's slightly larger than your pie plate. Be sure to dust both the top and bottom surface of the crust regularly to keep the dough from sticking to your rolling pin or surface. 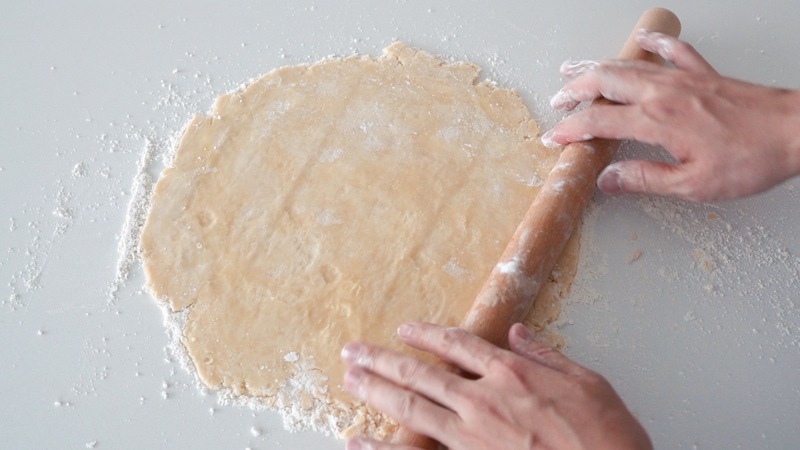 Roll the dough onto the rolling pin and then unroll it onto your pie plate. Fix any gaps or tears. 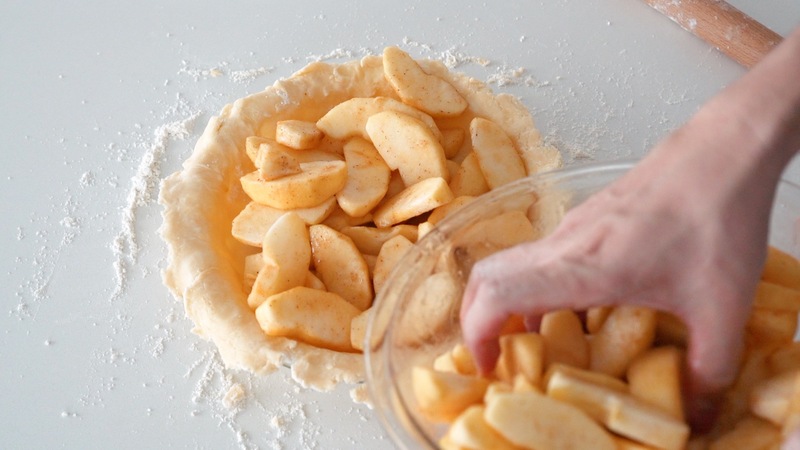 Arrange the apples in the pie plate, so there are no sharp edges sticking up. Roll out the top crust using the same method as in Step 9, then roll the dough onto the rolling pin and unroll it on top of the apples. Patch any holes or gaps using excess dough that's hanging off the edges, then fold the top crust under the bottom crust. Use your fingers, a fork or a spoon to seal the edges. In the photo, I'm using my finger to flute the edges. 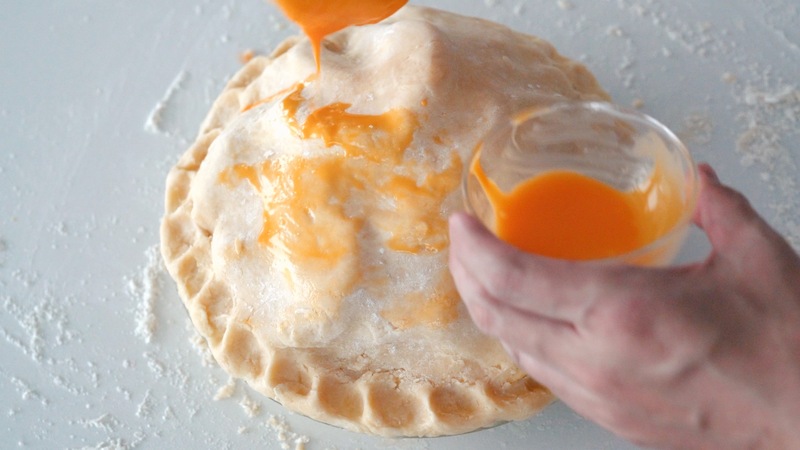 Use a pastry brush to brush the egg wash onto the top crust evenly. Try not to leave any puddles of wash around the edges, or they will get darker than other areas. Sprinkle the crust with 1 tablespoon of coarse raw sugar. 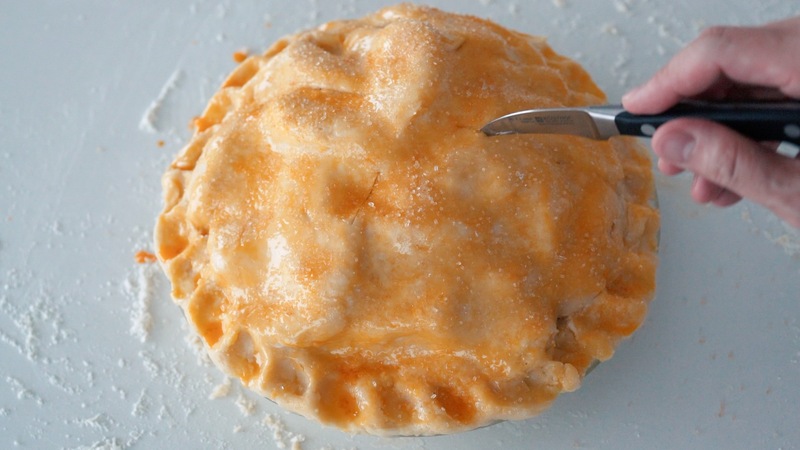 Use a paring knife to cut vents in the top of the pie. 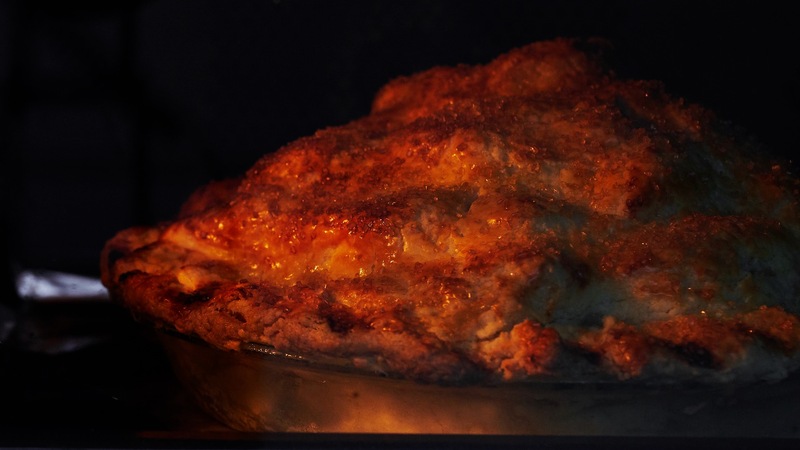 Bake your apple pie for 45 minutes to 1 hour. If you notice your crust is browning too quickly, you can turn down the heat of your oven. The pie is done when you can insert a skewer through one of the vent holes in the top crust without hitting much resistance from the apples. When the apple pie is done, let it cool completely on a wire rack before slicing. If you enjoyed this video head over to YouTube to give it a like 👍🏼 and Subscribe to our channel while you’re there!